Ever attempt to hold a dumbbell and a football in the same hand? You don’t even have to try it to know it just wouldn’t work. Yet, there is a way to practice throwing with added resistance to build more muscle. How? 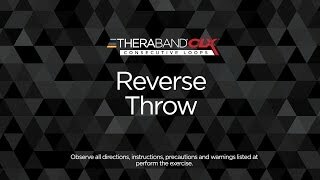 By using the Thera-Band CLX. Looping this innovative elastic device around your foot and hand allows you to mimic an overhead pass or pitch while working against the tension of the band. The added pressure helps strengthen the muscles in your rotator cuff—key to improving performance and reducing the risk of injury. Pitchers, quarterbacks, and other overhead athletes, take note: The unique Easy Grip Loop design of the CLX keeps your hands free. That way, you can grip the ball while you execute the move. Check out the steps below for this example of functional training at its finest. Place your opposite hand in the desired Easy Grip Loop. You should feel moderate to high resistance at the top of the exercise. Slowly allow your throwing arm to come down across your body as if you were throwing a ball. Repeat.